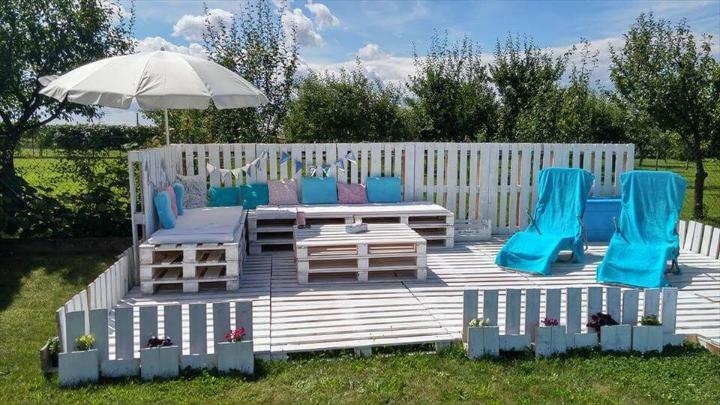 We are sharing here a phenomenal creative act of whole pallets wood boards, done by a genius lady who just loves to be a creative DIYer! The final results are causing a big jaw-drop to every looking eye as the incredible composition or setting of whole pallet boards yields a better family entertainer, the DIY pallet garden party lounge / deck and patio furniture, installed on a green garden carpet and is having a also a swimming pool in sides, an ever best and low-cost plan to feel relaxed in hot summer days when the sweat just keeps on to make you feel wet, suffocating, hot and finally sad! 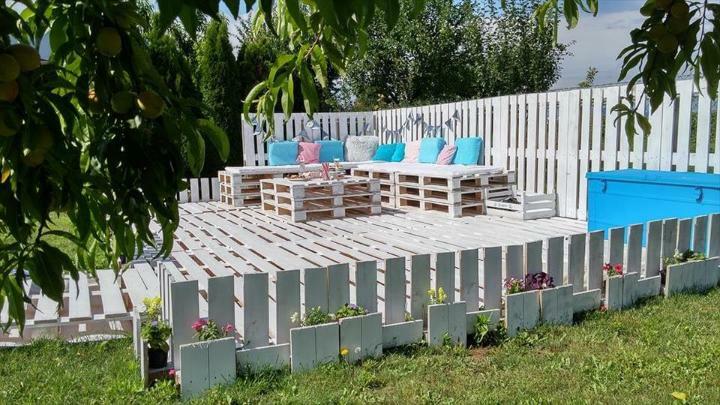 Rummage around and visit the local pallet sources to have them in big amount and install this family or friends fun-point in your greenish land! The same setting would also be highly recommended for a newly installed deck space, for a lower or higher level patio and also for a backyard area! 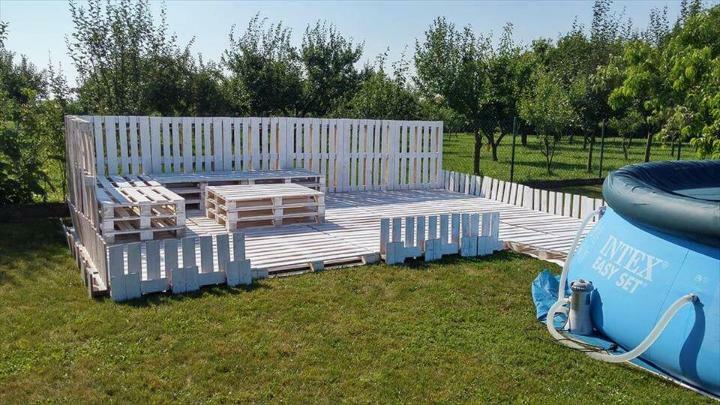 Double up your outdoor fun with whole pallets only, no cuttings are involved and no higher expenditures are a part of this project! Family or friends parties are a big reason to forget about the sad aspects of life and just to enjoy the time with great fun! DIY can really help you to organize your spaces for such a family celebrations, beverage parties and also to enjoy the poolside in your very spare time! 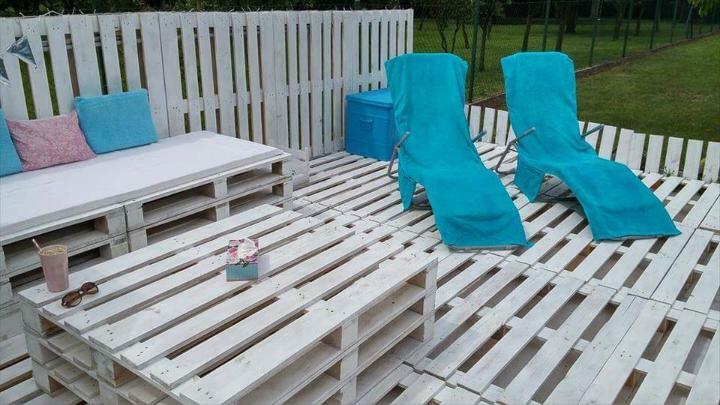 Here going handmade with whole pallet boards is resulting into this party lounge and you are seeing a preview of finally finished pallet outdoor party lounge and construction steps are given in details below! 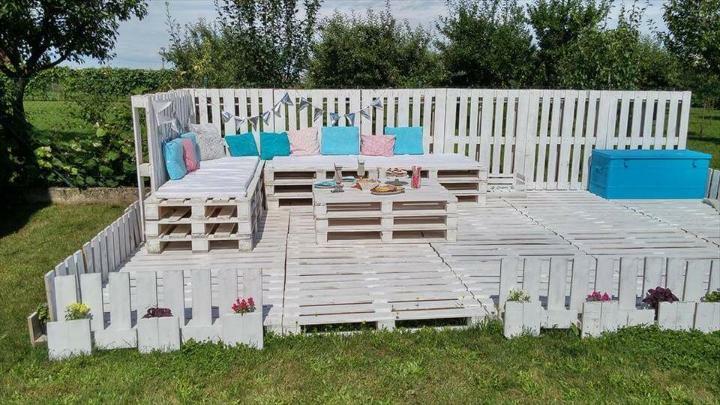 This entire party lounge looks damn gorgeous and lasting forever, it is all a creative pallet story and an achievement which would really make the outdoor lovers a big fan of pallets for sure! 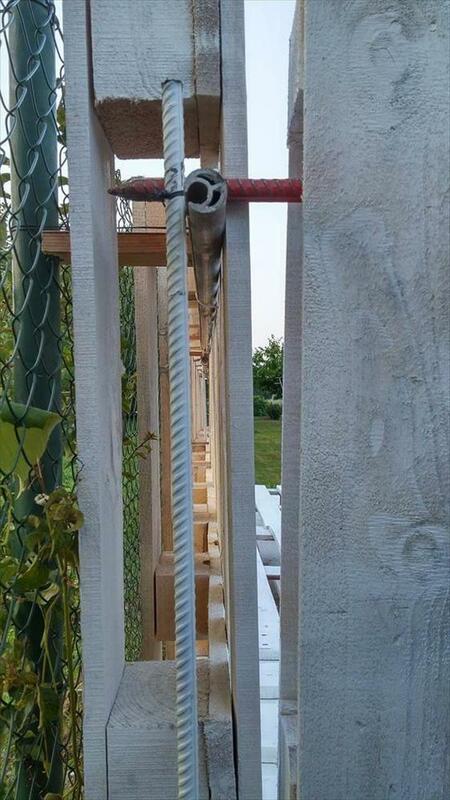 Our genius friend started this entire project with a sketch or plan in hands on which dimensions to achieve, are listed in details and going with configured values and measurements is always what that adds precision to your work and helps us to do the targeted project in short time period without wasting a bit of our supply materials! 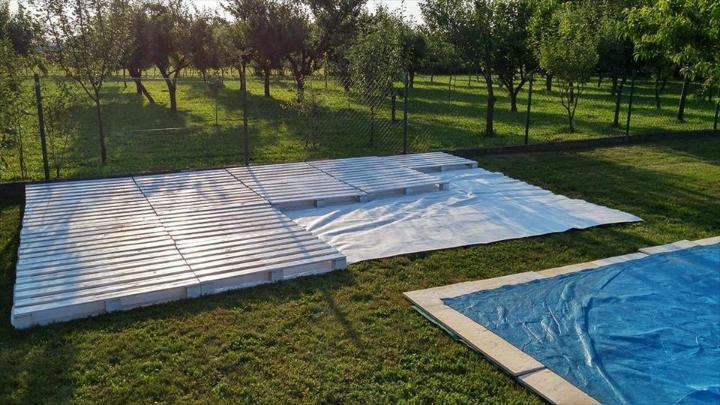 In the plan there are…..
20 pallets included for wooden floor installation having dimensions 100 x 120 cm! 3 pallets of 100 x 120 cm size have been selected for coffee table construction! 12 pallets of 80 x 100cm size for L-shape or sectional sofa set! 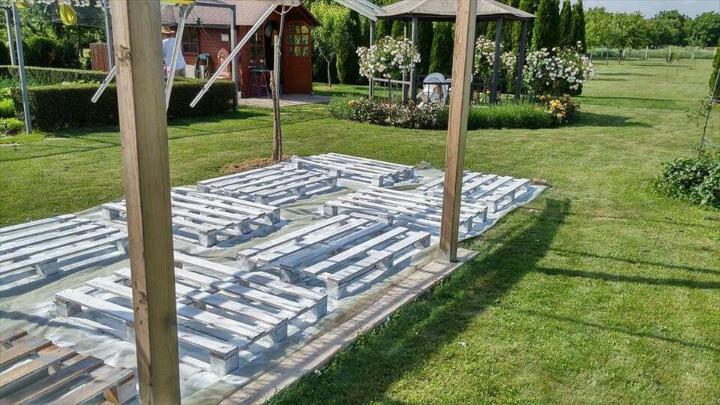 8 pallets of 100 x 120 cm for installation of high fence wall! 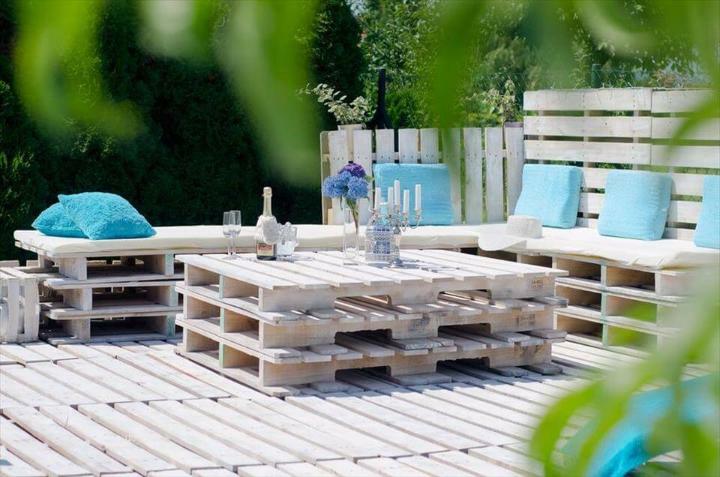 Some mini pallet planks for lower fence or for decorative edging! Terrace dimensions would be 4 x 6 meters! 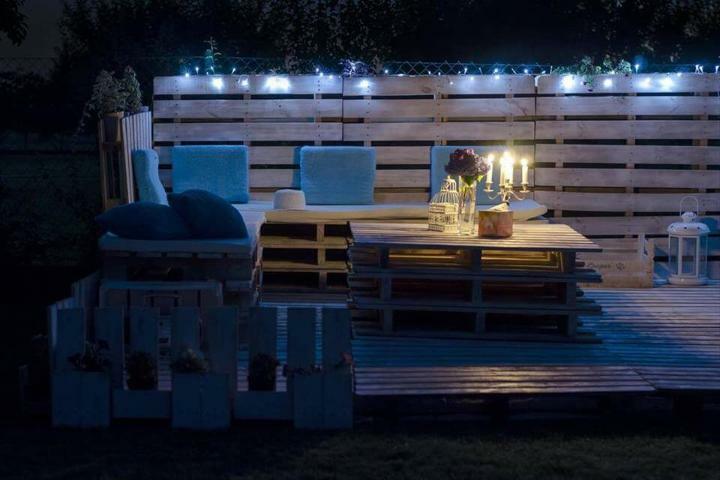 How to Paint the Pallet Wood? You Must Know !! A brighter tone of of all wooden surfaces! A total splinter free wooden soft touch! A dust-free nature of wood with no gunk-layer or ugly spots Also!! 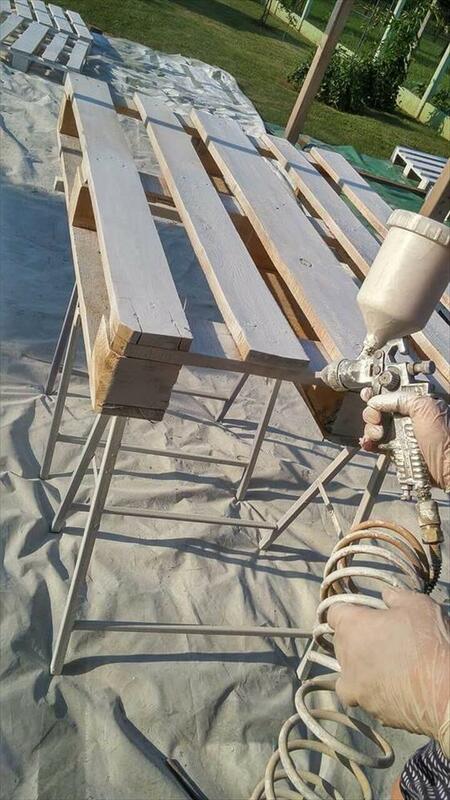 As paint is always one of the great finishing options that creates the personalized final appeal of your DIY wooden products, so it should be done in neat and fine way, to make all the pallet skids friendly to additional paint layers, they have been coated with the primer coming from the spray-gun nozzle! Wear gloves to avoid the spray-gun making your hands dirty! 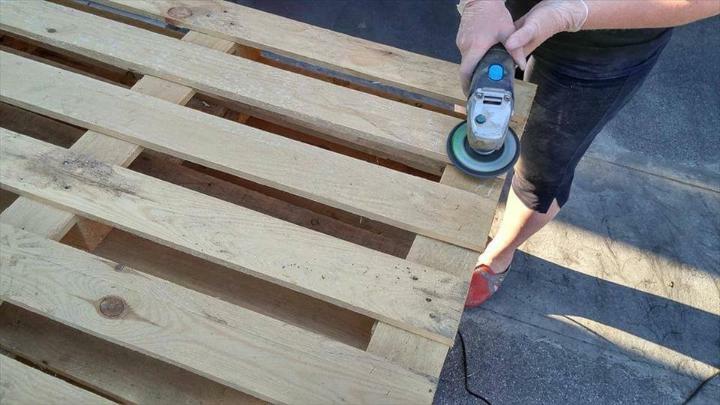 To get the bottoms of pallets coated with primer, the pallets have been raised on a metal stand! To not let the paint spoil your floors, first cover up the floor with old fabric sheets, clothes or with old newspapers! Finally! 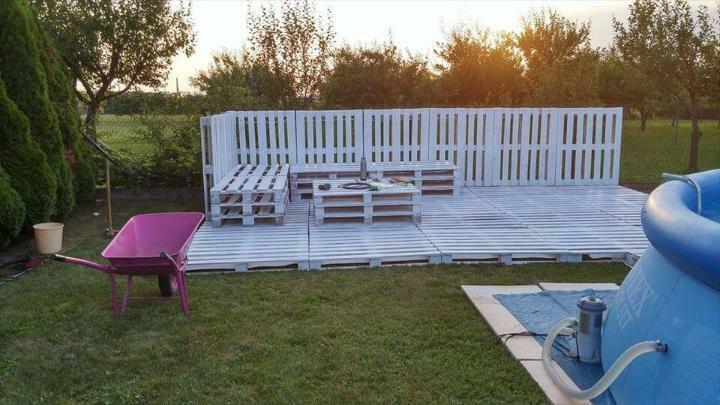 She painted the pallets in white and all you need to do is to fill the spray-gun with white paint! 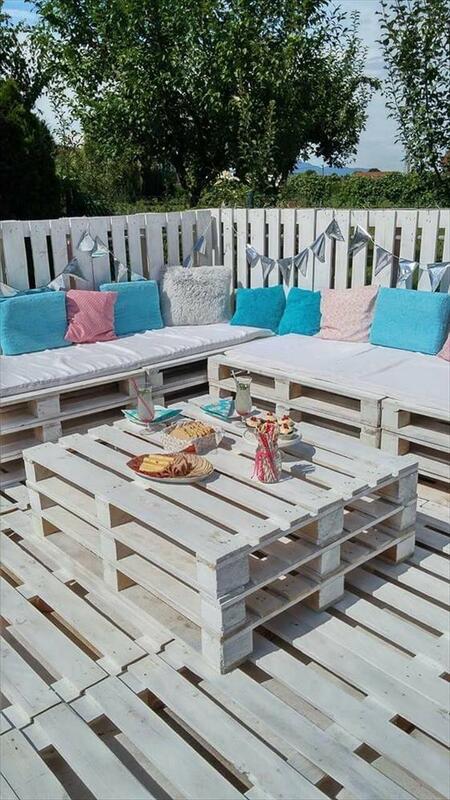 You can take help of family members or friends to paint the pallets quickly along with hanging lot of fun! As there are no major cuttings or dismantling of pallets involved in this project, so it would be all friendly to homey ladies! 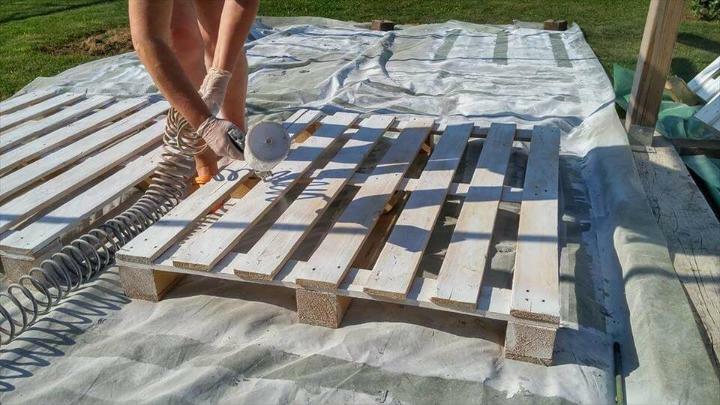 Now let the pallets catch some sun rays to get dried quickly and it can take up to a full day to adhere the paint layers better over the wood medium! 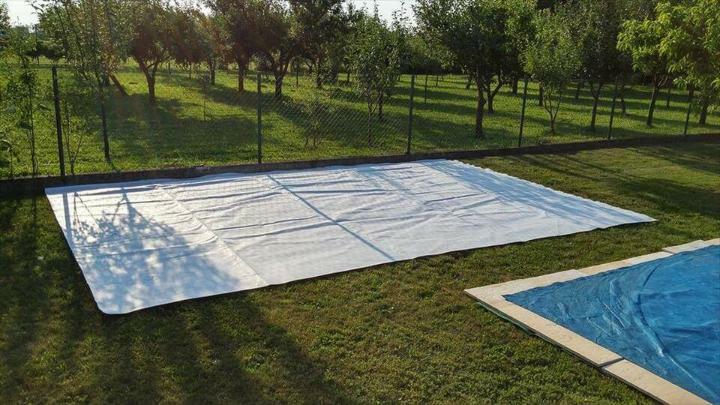 To prevent growth of grass between the wood, a geotextile fabric underlay has been spread over the garden grass having 4 x 6 meter size! The blue one is for the pool which is to install for swimming just in sides of this party lounge! Now pick the white painted and well dried pallet boards to install the wooden floor, you can make a rough arrangement of pallets first to cut the fabric sheet in accordance! Now install seats, tables and high fence wall according to sketch the see the project is all going well to completion! Make a complete inspection again to fix the errors or faults if any! The project is almost done here……! As corner sitting always help the seated members to interact well, so L-shape bench design has been selected here! To get the fence wall in stable position, may be a big challenge but she did it using the steel rods and metal wires as they can really handle the bulky wooden weights of pallet boards well! Now to time to enhance the decorative value of this party lounge by installing a decorative edging, the genius lady done it by installing a lower fence with dismantled and cut down lengths of pallets! The tiny fence walls around the colorful flowers, really did the job very well here, this just all creates a divine look of this handmade outdoor party sofa set! Making the seats cushioned and addition of pillows really raise the comfortable of this lounge to peak! Now one can enjoy family gathering here along with taking coffees, eating breakfast and also by celebrating the beverage parties with soft and warm feel of sitting comfort! Buntings have been added to give this entire lounge an air of party celebrations and two accent blue loungers have also been added to enjoy the poolside with a beverage mug or coffee cup in hand, just imagine!! 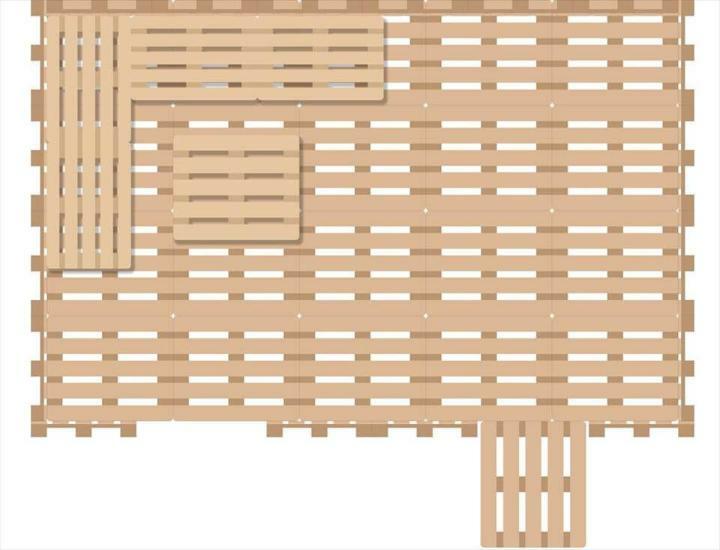 Rest of pallets have been reclaimed to build a chest as shown here placed aside in blue avatar, this will really help to secure your things and items you need to rock the party time! 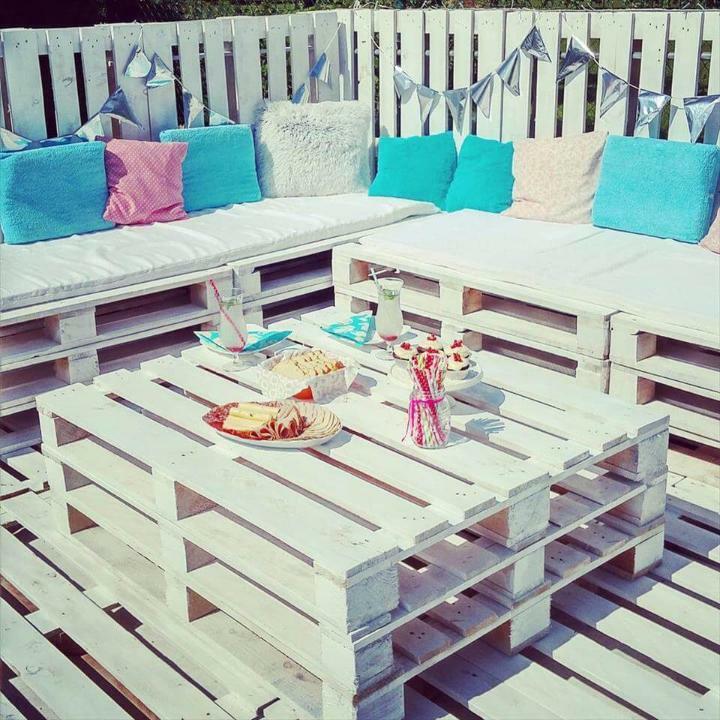 The results are really amazing here, how the whole pallet boards turned out into this magnificent outdoor party sitting, is really jaw-dropping! 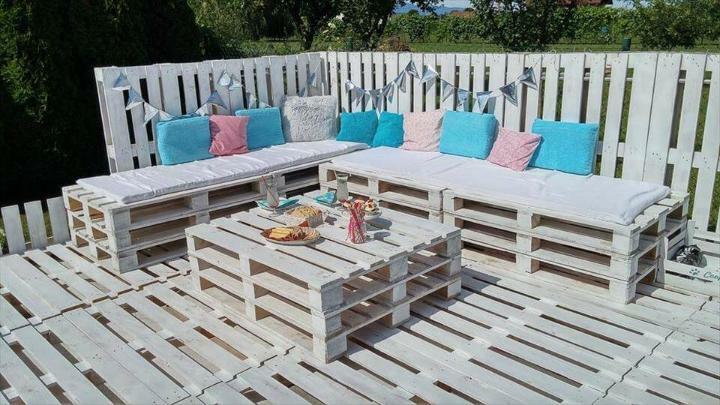 This creative setting of pallets can make everyone addicted to outdoor, the surprising sofa layout would be whole recommended setting also for summer guest entertainments! 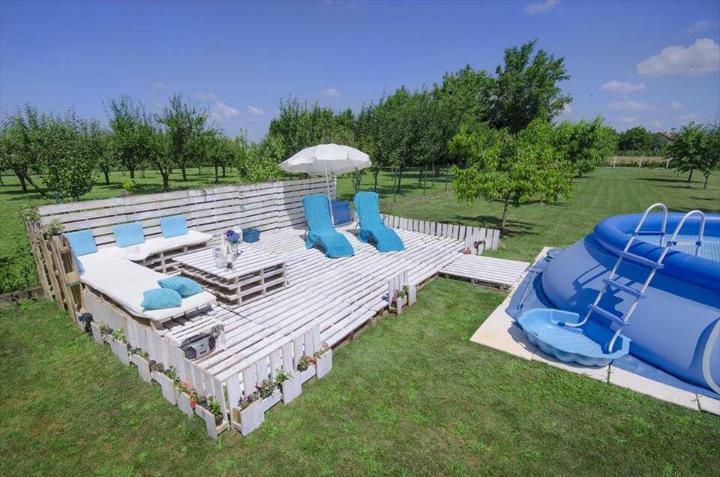 To target this outdoor party lounge for night fun and parties, the white LEDs have been installed across the top boundary of high fence wall that provides romantic soft glow at night! Assembly should be done with hardware that suit best to current fittings of pallets, nuts and bolt formulation would be rocking to combine pallets! 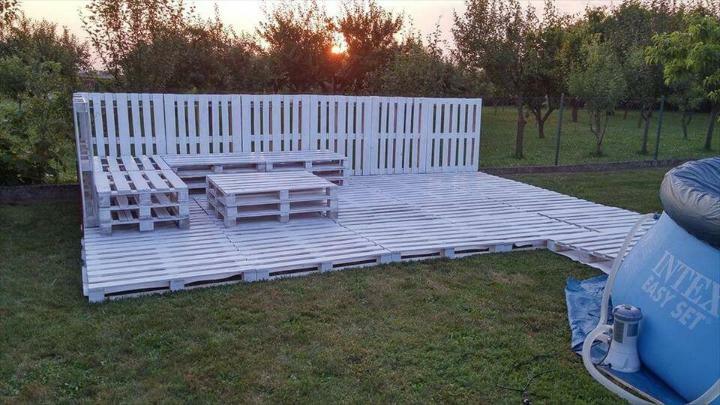 Here is the finally finished whole pallet platform, a guest entertaining better organizer outdoor and a breathtaking party celebration setting, would also make a love point, a most cherished place for a friend’s club and would also be a whole fun land for your kids!